By MH9: Professional boxing opens up the fans to exploitation. The term ring rust refers to an affliction suffered by inactive fighters, but do not be fooled by this myth. Fighters who have had a significant absence from the ring, either from injury, suspension or other reasons. Fighter who suffer from ring rust are required to have several fights against far inferior opposition to removed the ring rust that has detrimental effects on their timing and fluidity. So if ring rust is something that is cured by time in the ring you would therefore want you opponent to be a durable as possible. In recent times we have seen the return of Tyson Fury, who spend nearly 1000 days out of the ring. His comeback opponent lasted 4 rounds. Earlier in the year we saw Amir Khan return to the ring after almost 2 years out of the game. His comeback opponent lasted less that 1 round. Are these absences out of the ring significant? When you analyse the activity of fighter at the top level of the sport you will find that it is not necessary unique. WBC light heavy weight champion Adonis Stevenson has had 3 fights in the last 3 years. WBC featherweight champion Gary Russell Junior has had 4 fights since 2015. There is a certain art to staying a champion and fighting once a year but it is achievable. The champions and the growing number of fighters who fight infrequently continue to fight at their current level. Without being affected by ring rust, how is this possible, perhaps because it does not exist. If a fighter has been in active they will of course go through a training camp in their preparation for their return to the ring. As in any other training camp the fighter will have a number of rounds of sparring. This sparing will prepare them for there opponents style and expected tactics, whilst conditioning the fighter for their up and coming bout. Fighters will often clock up a large number of rounds in sparing. If we look at the case of Tyson Fury in his period of inactivity he has spared the likes of Daniel Dubois, Lucas Brown, Tom Little and Dave Allen, all fighter with far more upsides than his comeback opponent. Would he not have got rid of more ring rust during sparing than in 4 rounds with Sefer Seferi? Unquestionably yes. 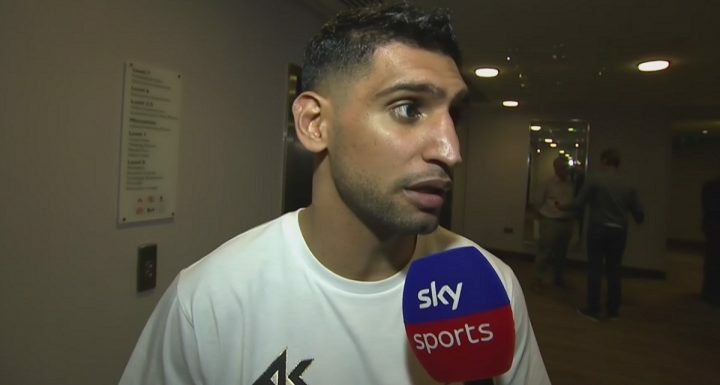 In the case of Amir Khan did the less than a minute in the ring shake off any cobwebs that he had from almost 2 years out after suffering a devastating knockout defeat to Canelo Alvarez? Once again unquestionably no. Countered to this train of though is the argument that sparing can not replicate fight night. This is true to a degree. However, the intensity of sparing can be increased in many ways. It is clear to see that in most comeback fights that the level of opponent is far beneath that of the level that could be matched in sparing so it would appear that sparing can replicate and exceed the benefit of a fight to remove ring rust. Fighting in under the bright lights. This is a more plausible argument, there will be nerves but this is something each fighter needs to deal with. In regards to the fighters in question the opponents chosen to shake off their ring rust will have very rarely fought under the bright lights so it is just as much an issue for them as it is for the big name fighter who is getting rid of the rust. So next time we hear the comment ring rust banded around we must roll our eyes and ask ourselves are we being made a mockery of fans once again. Perhaps it is better for non sanctioned fights to take place as a friendly fixture to get rid of the so called ring rust or for the boxer to be fully prepared upon their return to the ring.